Ethereum Price Analysis Jan.15: Will The Positive Momentum Continue? Yesterday, the market saw a nice mini-rally. BTC price gained 5% (Bitstamp) and is now trading at the $3650 price level after hitting a significant resistance level and giving away some of its gains. The Ethereum price had a nice 11% run and is now trading around the $127 price level, Other smaller Altcoins were moving much more radically, with some coins gaining 30-70%. In the time of our last analysis was published, ETH was trading at the 0.5 Fibonacci level, and we anticipated another move down towards the $114 price level, at the 0.618 fib retracement level. Since then, ETH has declined to our expected target at the 0.618 retracement where it found the support needed to ignite yesterday’s bull-run. As we explained before, The 0.618 Fibonacci retracement level is always a sweet spot to expect a bounce, as it is the bulls most favorite place to enter their long positions. ETH price is currently back in the $124-$131 trading zone (the gray area on the following chart) this range is a support/resistance zone. 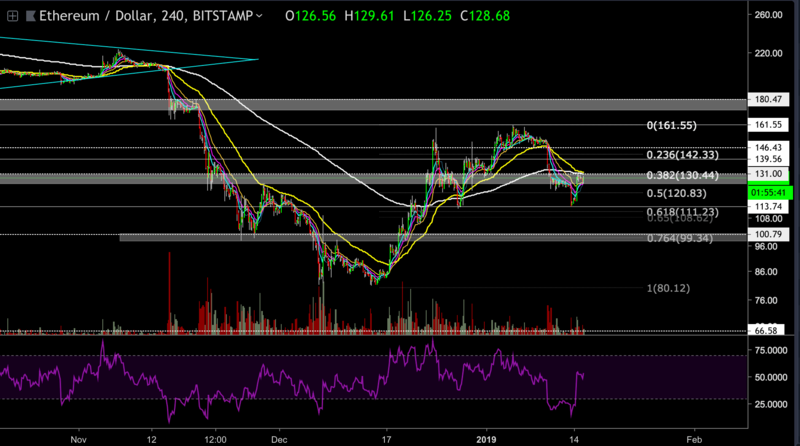 ETH will most likely retest the $131 resistance level, where both the 55 EMA and the 200 EMA are waiting as an extra resistance. If the bulls manage to breach the resistance level, then the next target could be found at the $140 price level or even higher at $146, which is another Fibonacci level to watch. On the other hand, if ETH gets rejected at the $131 resistance level, then it might try to retest the $124 support level or even lower to the $114 price level. It is too early to determine whether yesterday’s run was the beginning of a new positive trend, but if that is the case, then there is an excellent chance to retest the $160 highs or even higher in a longer time frame. We want to see ETH price holding above the $124-$131 gray zones as the first sign of a new trend direction.